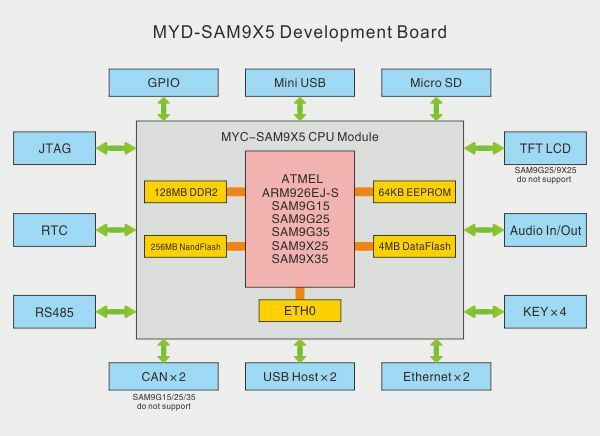 The MYD-SAM9X5 Development Board is designed by MYIR for the Atmel AT91SAM9X5 series ARM926EJ-S processors which can operate at up to 400MHz. 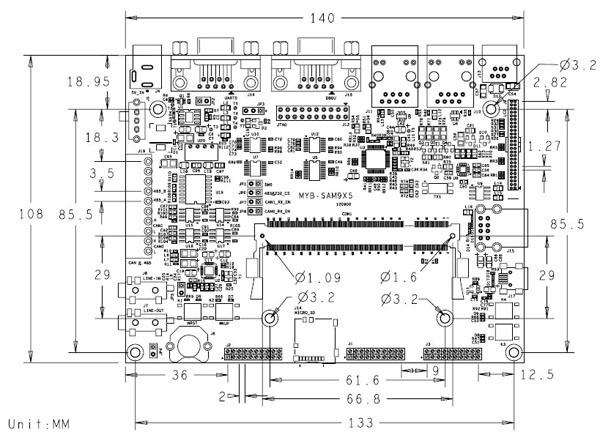 It has a base board which can be equipped with five different CPU modules based respectively on Atmel’s SAM9G15, SAM9G25, SAM9G35, SAM9X25 and SAM9X35 embedded MPUs. All five CPU modules are sharing the same circuit design with minor configuration settings. They are compatible with Atmel's official SAM9X5-EK and can work on SAM9X5-EK's base board directly. The MYD-SAM9X5 is capable of running Linux and Android operating systems and also provided with complete sample codes bundle for the peripherals using Keil's MDK-ARM to enhance debugging capabilities for non-OS development. The 4.3- and 7-inch LCD panels are add-on options for the SAM9G15, SAM9G35 and SAM9X35 evaluation kit. It can work in harsh environment supporting -40 to +85°C extended temperature operation. MYIR also offers camera, WiFi, GPS and GPRS modules as add-on options which have greatly enhanced the functions of the development board. 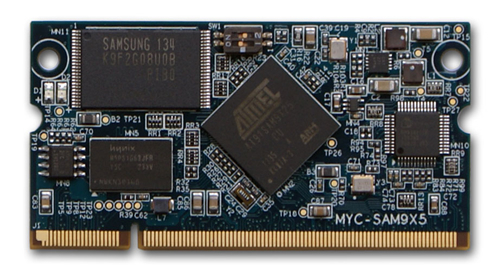 The CPU module MYC-SAM9X5 has the most features of the processor and integrates 128MB DDR2 SDRAM, 256MB Nand Flash, 4MB Data Flash, 64KB EEPROM and Ethernet PHY on board. 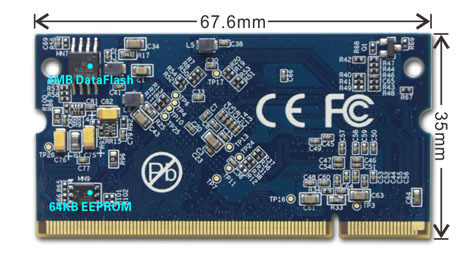 It is connected with the base board through a 1.8v DDR2 SD-DIMM 200-pin connector which provides an interface for the base board to carry all the I/O signals to and from the CPU module. A set of peripherals have been brought out through headers and connectors on the base board including serial ports, USB, Ethernet, CAN, LCD, Audio, SD, etc. From above table, we can see if you need Ethernet, except MYD-SAM9G15, other four models all can support; if you need two CANs, two Ethernet but no need LCD, the MYD-SAM9X25 is a good choice; if you want to evaluate the performance of this industrial board, the MYD-SAM9X35 has the most complete functions. 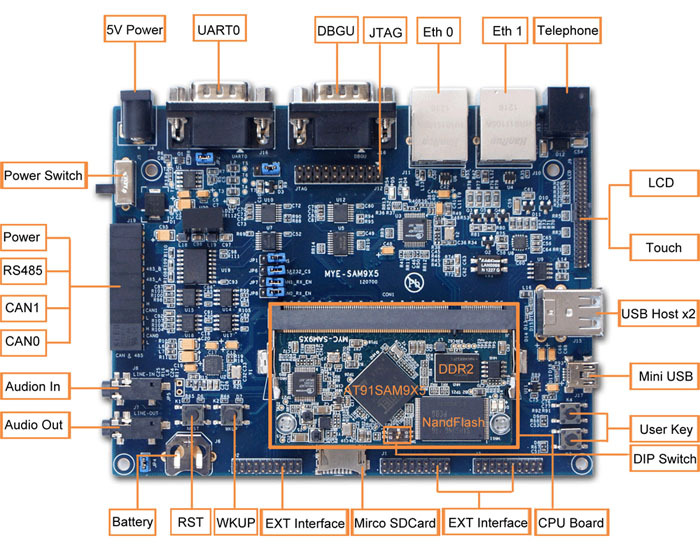 The MYD-SAM9X5 Development Board comes along with Linux 2.6.39 and android 2.3.5 software packages, MDK-ARM sample codes bundle, necessary cable accessories as well as detailed documents to allow customers to start development soon when getting the goods out of box. 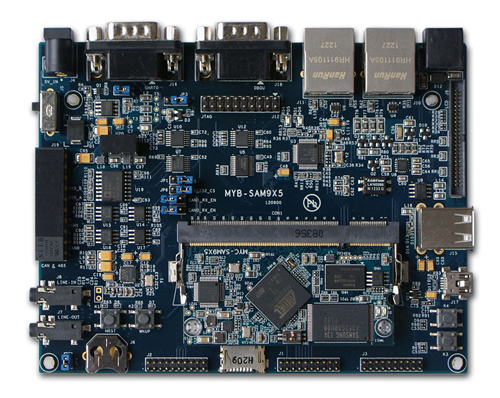 It is a low-cost full-featured development board for embedded and industrial applications. - MYD-SAM9G15 doesn’t support Ethernet. 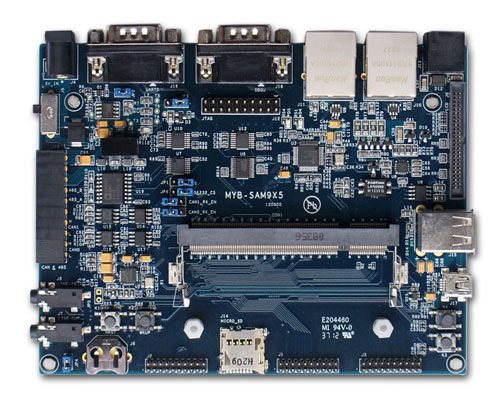 The Atmel® SAM9G and SAM9X embedded MPUs are high-performance, highly integrated processors built the good foundation of the Atmel® ARM926-based embedded MPU line. Running at 400 MHz, they are designed to complement the power of the ARM926 core; these flexible devices deliver a rich combination of peripherals including up to two Ethernet, two CAN, three USB ports and seven UARTS. Additional features include an integrated soft modem, TFT LCD controller and LPDDR/DDR2 memory support. A multilayer bus matrix architecture and multiple DMA channels ensure uninterrupted data transfer with minimum processor intervention. Low voltage, low power consumption and reduced system cost make these devices ideal for cost-sensitive machine-to-machine applications. refer to the product user manual and schematics for details for your development. 3. We accept custom design based on the MYD-SAM9X5, whether reducing, adding or modifying the existing hardware according to customer’s requirement. 1. Could the SAM9X5 series boards connect to external hard disks? Could the SAM9X5 series boards connect to external hard disks? No, they could not connect to external hard disks directly. Actually, very few ARM CPU can support connecting to external hard disks directly which take up much resources and inconvenient in maintenance. We recommend user can consider using USB to hard disk way or using SD card to replace the hard disk. 2. Can you send items for supporting -40 to +85 Celsius Extended Temperature Operation? Can you send items for supporting -40 to +85 Celsius Extended Temperature Operation? Yes, we delivery commercial-level boards (working temp. from 0~70 Celsius) by default. If you need to buy the industrial-level boards which can support -40 to +85 Celsius Extended Temperature Operation, please contact us for availability and price. 3. 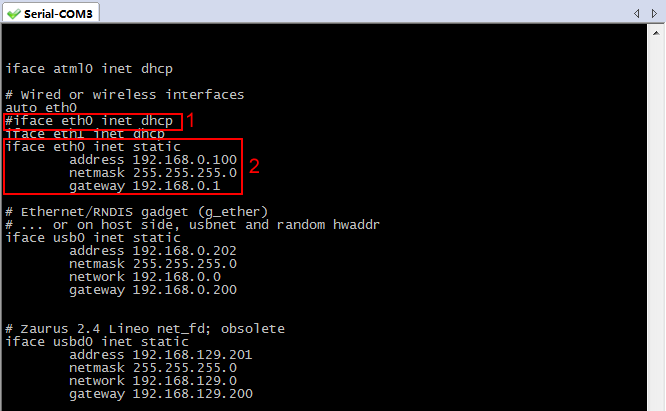 How to modify the dynamic IP to static IP in Linux? How to modify the dynamic IP to static IP in Linux? c) Note: please do not remove the "auto eth0" row. 3. Please save the interfaces file and reboot, it will be ok.
Hello, can you answer below question for your SAM9X5 board? 1. Is the telnet server open? 2. Is there FTP server? Hello, all our development boards have enabled the telnet server by default and has sftp function. 5. 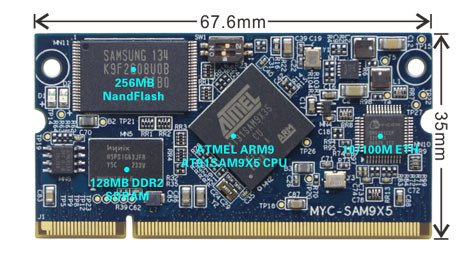 What are the differences of the Atmel SAM9G15, 9G25, 9G35, 9X25 and 9X35 processors? The Atmel AT91SAM9G15, SAM9G25, SAM9G35, SAM9X25 and SAM9X35 five CPUs are all based on ARM926 cores and can work at up to 400MHz. What are the differences of them? 6. How to control LCD backlight? May I know how to control the MYD-SAM9X35 board LCD backlight and adjust the brightness in Linux? Is there any example? You can refer to the pwm example as we provided product disk to know how to use the backlight. 7. What is the maximum memory size that can support for TF/SD card by SAM9X5 series board? What is the maximum memory size that can support for TF/SD card by MYIR's SAM9X5 series board?